Back in Permaculture’s home state of Tasmania, come and see its co-originator, David Holmgren, take us back through the decades of our lived history in the streets where the quarter acre hosted the Aussie post war dream, through the decades of of rising affluence and additions, aging and infill, permaculture inspired retrofit and on, through a gritty but inspiring and realistic transformation in the Great Depression of the 2020s. Aussie Street is a permaculture soap opera, made real by masterful storytelling that sounds a warning and clarion call for direct action on the home front. The presentation is also a window into the rich palette of design solutions and tips that Holmgren has explored in in his latest opus, Retrosuburbia; the downshifters guide to a resilient future. Come and be entertained, inspired and challenged by one of Australia’s unsung heroes, presenting in Hobart where the world changing permaculture concept was hatched on the fringes of suburbia more than four decades ago. Doors will open from 4pm. David will begin his presentation promptly at 4:30pm. This will be followed by a Q&A discussion and a sharing of thoughts and ideas and tips for bringing the retrosuburban ethic into your own life. This book is a dance, a tango between our habits and our actions, our visions and our intentions. RetroSuburbia boldly renovates what we know as our safety net and replaces it with an action plan; planning for the worst and hoping for the best. The answers are in the everyday. Let the transformation and retrofit begin. Listen to David being interviewed on Radio National on ways we can transform suburbia and why. Watch a video presentation of David talking about Retrosuburbia. The venue has ample (free) parking. There are no minimum age requirements for this event, although all children must be accompanied by an adult. Children under the age of 15 receive free entry. Please get in touch via permaculturetasmania.com or the Permaculture Tasmania Facebook page. Please note we are a volunteer organisation and will respond as soon as possible. As a not-for-profit organisation, ticket sales are the sole source of funds available in order to book venues for events such as these. As such, we are unable to offer refunds. No. There will be a list at the door. Come and be entertained, inspired and challenged by one of Australia’s unsung heroes, presenting in Launceston for the first time in many years. David Holmgren, environmental designer, author & futurist, with presentations on Transition Towns and Love Our Street, is ready to inspire with ideas on how we can achieve a more sustainable life. In this workshop, facilitated by Beck Lowe, participants will be invited to consider their current garden space and household setup, and start planning for increases in sustainability, productivity and resilience. We will use the ideas in David Holmgren’s book RetroSuburbia: the downshifter’s guide to a resilient future, to examine the potential for household-scale food production and introduce permaculture food growing strategies. By the end of the workshop, participants will have a starting point for designing their gardens – and lifestyles – to become bountiful and sustainable. In partnership with Banyule City Council. Aussie Street is the history and future of suburbia as a serious but humorous presentation by permaculture co-originator David Holmgren. Over more than a decade this presentation has inspired creative household and neighbourhood responses to climate, energy and economic threats that increasingly cast a pall over the future of suburbia. Rather than condemning our history and prospects, Aussie St empowers and enlivens us. Aussie St is now a short story built into a new book Retrosuburbia: the downshifter’s guide to a resilient future. This manual draws together the patterns glimpsed in the presentation both of which have been transformed by Brenna Quinlan beautiful illustrations. Permaculture guru David Holmgren, local farmers Gung Hoe Growers and artist, cultural leader and storyteller Aunty Julie will discuss how they ended up in this region, what inspires them and the events which led to their current occupations. 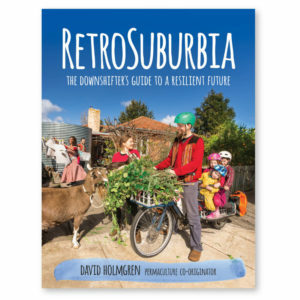 Permaculture co-originator, David Holmgren’s new book, RetroSuburbia: the downshifter’s guide to a resilient future (2018) is a bold manifesto on how to activate change that begins in the household. RetroSuburbia promotes household food growing, retrofitting and non-monetary activities of exchange and reciprocity. In this discussion, followed by an audience Q&A session, David will advance the ideas of permaculture as a creative framework for applying vital retrofits to our homes, gardens and most fundamentally, our behaviour. Come and be part of Holmgren’s insightful, thought-provoking vision for a life-enhancing sustainable future. Did you enjoy David Holmgren’s RetroSuburbia and want to share the message wider? 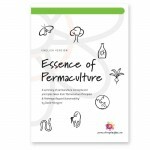 This two-day workshop is open to permaculture and sustainability trainers and community networkers who want to incorporate the book’s inspirational ideas and practical solutions into their current or future work. Participants will explore methods and tools for supporting people to create fulfilling, abundant and sustainable lives through retrofitting their homes, gardens and lifestyles. Undertaking this workshop will allow you full access to the retrosuburbia resources being developed to help educators and facilitators, as well as giving you the opportunity to be listed as a RetroSuburbia Facilitator on retrosuburbia.com if you choose. The cost of this workshop is $400 for two days including morning and afternoon teas. We encourage you to bring food to share for lunch. There will be an optional tour and dinner at local urban permaculture enthusiast Joel Meadow’s on the Saturday evening. Workshop facilitator, Beck Lowe worked closely with David Holmgren on RetroSuburbia – editing, researching and project managing. She is an enthusiastic and experienced permaculture educator and has been involved in permaculture training at all levels from introductory workshops to post-graduate for more than 15 years. She runs regular Permaculture Design Courses in central Victoria, and will once again be a lead teacher on the Rocklyn Ashram PDC.